Home Resources Osmo Genius Kit Game System for iPad: Hope or Hype? As a parent and former teacher, I'm naturally suspicious of screen-based "edutainment" systems like the Osmo Genius Kit Game System for iPad. Instinct tells us that kids should be out in the sunshine, making friends and learning by exploring. At the very least, if they have to engage with screens, they should be creating rather than consuming. Research has shown that screen time harms elementary-age children's abilities to engage socially. And the American Academy of Pediatrics says that children under two should have no screen time at all. 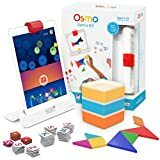 What is the Osmo Genius Kit Game System for iPad? What's in the Box and How Much Does it Cost? But many people also believe that logic and coding skills are the paths to the jobs of the future. Many also think that the sooner kids can get on with learning these skills the better. And let's face it, kids of all ages enjoy playing video games. So, where does that leave us? First things first: the Osmo Genius Kit Game System for iPad isn't a video game system. Nor is it, despite the bright colors and simple interface, designed for toddlers. Rather, Osmo is an accessory kit that you can use with your iPhone, iPad or Fire device. The kit comes with several different games and activities to support different kinds of learning. There are math games, coding games, word games, and art games. Additionally, kids aged four through twelve can explore music, drawing, critical thinking, money skills, spelling, and more. What makes this system unique is that it is interactive on several levels. Of course, your child interacts with the screen. But Osmo also has physical components that your child can manipulate for simultaneous digital and physical play. It's an interesting concept, and it has my attention. It has also captured other people's attention. For example, Osmo won the 2015 Scholastic Teacher's Choice Award. It also won a Parent's Choice Award. This toy also won a Kapi Award for Innovation. Furthermore, Time Magazine awarded it "Best Invention of 2014." So I'll set aside my prejudices for now and give the Osmo a proper look. The Osmo Genius Kit Game System for iPad is not a full-console gaming system. Rather, it's a set of accessories that you use with your device. The Genius kit is one of several different available kits. It comes with a base to hold your device, a "reflector," and five different games for children aged five to twelve. The included games support learning in the following areas: math, drawing, spelling, visual thinking, and problem-solving. It comes with a plastic tangram set, as well as number tiles, letter tiles, and stacking storage containers to hold them. The Osmo Genius Kit Game System for iPad is available from various online retailers, as well as from Osmo's own website. Depending on the retailer, you can expect to pay between $75 and $100. The Osmo Genius Kit Game System for iPad comes with a base and a red reflector. First, you stand your device in the base. The camera's eye should be on top, facing front. Then you place the red reflector over the eye. This will allow the camera, and therefore Osmo, to see what's in front of the device. What will be in front of it, you might ask. Your child's hands, and whichever of the manipulables your child is using. ("Manipulables" is teacher-talk for physical objects a student manipulates with his or her hands.) For example, if your child is working with the tangrams program, he or she will use the enclosed plastic tangrams in front of the device stand. And Osmo will be able to "see" what he or she is doing and offer feedback. This is actually pretty impressive. The Osmo Genius Kit Game System for iPad comes with five nifty games. My favorite is Masterpiece, a drawing game. Your child engages with Osmo by drawing on a piece of paper within the reflector's viewing area. Osmo responds by showing both the drawing and your child's hands, as he or she creates. Tangrams are a puzzle system invented in China between 960 and 1279 AD. Trading ships brought it to Europe in the early 19th century. Parents and teachers love it because it teaches kids analytical and creative thinking. The gist of it is creating pictures and patterns from different sizes of triangles, squares, and parallelograms. Like with Masterpiece, your child chooses an image to create from the catalog. Osmo puts the image onto the screen, and your child uses the enclosed pieces to try to recreate the image. Your child can choose easier puzzles or harder ones, do them for their own enjoyment, or compete against a friend. It's a new twist on an old educators' favorite. Now, this is really cool. Newton is a problem-solving game that encourages three-dimensional thinking. Here's how it works. First, your child takes any small object and places it on the pad in view of the red reflector. Alternately, he or she could draw a line, a curve, or a figure. Then Newton shows the image of a ball slowly dropping from the top of the device's screen to the bottom. The player's job is to manipulate the drawing or object to guide the dropping ball into a target area. It's harder than it sounds, and chances are, kids will master it a lot faster than their parents will. Words is a game that teaches spelling skills. Osmo shows an image followed by a number of blanks to indicate the number of letters in the word. Your child uses the enclosed letter tiles to spell out the word. Because Osmo can "see" your child's work, it can also offer feedback. You can also upload words that are important to your child, like the names of family members, or download free content like geographical names. Your child can play this game on his or her own or compete against others. Numbers is, as the name suggests, designed to help with math skills. But not just skills -- this game teaches mathematical creativity, and this is something a lot of schools ignore. Wait, how can math be creative? I'm glad you asked that. We're all used to thinking of creativity in terms of art and written expression. But mathematics isn't just memorizing facts and formulas. Just like words have synonyms, there are different ways of expressing numbers, too. The number 16 isn't just 15 + 1, for example. It's also four times four. It's also 19 minus three. Numbers lets your child stretch their mathematical creativity by displaying a number. Your child then uses the enclosed number tiles to create that number by adding, subtracting, or multiplying other numbers. It teaches that math can be fun and creative, just like art. Once again, I'm impressed. The Osmo Genius Kit Game System for iPad isn't the only kit available. There are two other kits. What's more, you can buy individual add-on games as well. The Racer Kit and Explorer Kit come with all of the games described above, plus a few others. Additional kits will set you back between $100 and $200, depending on your retailer. The Racer Kit, for example, comes with the Hot Wheels Mind Racers game. This, as the name suggests, involves racing two Hot Wheels cars down a ramp and into a virtual world. You get six different cars, and each has its own personality and specs. They can race through eight different worlds. It's a fun, fast-paced game with lots of yelling and throwing things. And if you have a Hot Wheels enthusiast in your house, chances are, they'll love it. The Explorer Kit comes with three different coding games, as well as coding manipulables to help your child get the hang of programming logic. A lot of people tune out when they hear terms like "programming logic" and "coding." But these are fun, interactive games that kids can play alone or with others. There's a quest, several puzzles, and a "coding adventure" that make these concepts interesting and accessible to kids aged seven and up. You can buy all of the above-mentioned games individually. You can also buy add-on games like the three Disney/Pixar-themed drawing games and a pizza-making game that helps develop money skills. Individual games will set you back between $20 and $60. According to Osmo, 30,000 schools use their products to teach both academic and collaborative skills to children in kindergarten through sixth grade. The company encourages teachers to use it to teach collaboration and teamwork, as well as academic skills. Toward this end, Osmo provides free lesson plans and a user-friendly teacher's guide. And from this former teacher's point of view, it looks pretty neat. There really is a lot to like about the Osmo Genius Kit Game System for iPad. The combination of virtual and physical tasks is one of the most innovative things I've seen recently in toys. The system helps kids to develop a range of skills in exciting and interesting ways. And it's surprisingly reasonably priced. At the same time, it's a real drag that it's only compatible with Apple and Amazon products. Our family, and most of the people we know, to be honest, are Android users. And we're not interested in switching over to a whole new technological ecosystem just for the sake of one toy, no matter how cool. Is the Osmo Genius Kit Game System for iPad for you? Of course, only you can decide that. But if you're already an Apple device or Kindle Fire user, you should definitely check it out. Osmo is an innovative product, and it looks like lots of fun. But is there anything similar out there? Yes and no. There are plenty of children's tablets on the market. But as far as educational toys that merge the virtual and the physical, there is only one. Sort of. You've probably heard of Leapfrog. Leapfrog is Osmo's main competitor. Their LeapPad was one of the earliest tablet-like learning technologies aimed at kids. The first LeapPad came out in 1999. Since then, their product line has expanded to include a wide variety of apps, devices, games, toys, fridge magnets, and more. The two main differences between Osmo's and Leapfrog's product lines are these. First, Osmo's target market is children aged four through twelve. Leapfrog aims its products at ages three months through six years. The second difference is that while Osmo addresses a variety of subjects, Leapfrog's product focus specifically on reading and writing. There are other differences as well. For example, Leapfrog's product line includes devices, stand-alone manipulables, and a whole range of interactive toys and games. In addition, parents can also subscribe to a paid monthly service that provides educational games. Osmo, and the Osmo Genius Kit Game System for iPad does a small number of tasks, and does them well. Leapfrog tablets can cost as little as around $40 to $60 for a large-key keyboard with a black and white screen for toddlers, to over $100 for a tablet for older kids. If you're looking for a fun way to use technology to support different kinds of elementary-level learning, the Osmo Genius Kit Game System for iPad could really be worth your time. It's innovative, both in the way it combines virtual and physical learning and in the way it focuses on some of the kinds of learning typically overlooked in traditional education. It's also really reasonably priced. But remember that Osmo is for kids aged four through twelve. If your kids are younger than that, Osmo probably isn't for them. And if you're an Android-only user, well, it's probably not for you, either. Will the company make Android-compatible products in the future? We sure hope so. Do you have experience with the Osmo Genius Kit Game System for iPad, or any other virtual learning toy? Let us know about it in the comments!